Black leather style finish bracelet, necklace pendant gift boxes. Size 65x80x28. Leatherette necklace box with gold band outer trim and velveteen pad insert. White satin finish internal trim and pendant/necklace pad supplied in white or black velvet colours. 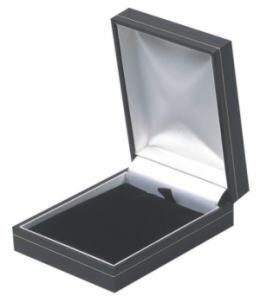 Quality finish Black leatherette jewellery display gift packaging box with velveteen insert. Can also be used as bangle box with removable insert removed.